My decluttering spree has moved to D’s room, something that isn’t a quick or easy task. That 2inch piece of scrap ribbon? Great for sticking and crafting. That empty toilet roll? It becomes either drawn all over with intricate little pictures or ripped into little shapes and coloured. Most of it ends up under her bed, together with “little people” as she calls Playmobil, drawings and books, lots of books. 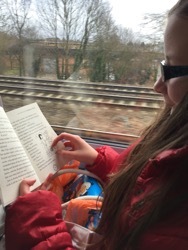 I never take for granted T and D’s love of reading, they much prefer to choose a new book in town rather than a trip to a toy shop and, more often than not, the book starts to be read even before we’re home. They both received the same book for Christmas (believe me, it’s easier) as they find the concept of sharing difficult. 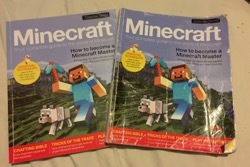 T’s book is on the left of the picture, still pristine. That’s how he likes his books to be. No marks, no folds, no damage. Each book in his room is stacked, by author. If there is the slightest hint of a fold or mark, he doesn’t like it at all. A couple of times D has been overjoyed that he’s given her one of his books, because it’s either got a crease or a pen mark. She’s been very pleased at his generosity when it’s been more a case that it no longer has a place on his bookshelf, he then wants to replace it with a pristine copy. The one on the right in the picture is D’s. It’s battered and well travelled. I covered it with sticky-back plastic about a week after Christmas because it was already showing signs of wear. D takes it everywhere, sometimes carrying it by one of the covers, ready to dip in and read. It’s bundled into her school bag just before we go in and is retrieved at home time, heading up at b e d time too. It’s a comforter for her as well as a reading source. So, the decluttering of her room isn’t a 5-minute task, it’s a little bit a day I think. Undertaken when they’re at school as change can be difficult to manage. One things for sure, the charity shops always do well with the toys bought previously (because T or D had shown an interest), admired, opened and discarded – as “play” is not something that came easily to either of them (it didn’t at all).